As we are settling in December and celebrating our UK Search Award, we want to take one look back at November. This time we want to focus our attention to the top publishers in the UK. First we will pay attention towards the competitors with the highest publishingrates. Next we will ascertain wether we perceive these publishers in the top 5 for Google News OneBoxes for desktop. Then we will validate our findings through the analysis of the Google News Boxes for mobile. We will also compare desktop and mobile results. In the last part of the analysis we will focus our attention to News Carousels and AMP Carousels in contrast to the overall mobile News Boxes. For closure we will identify the best publishers in the UK. Dailystar.co.uk barely edging out the competition. Let us first take a quick look at the most published news outlets in the UK. As we see, we have a similar progressing curve for all publishers with dailystar.co.uk just edging out the competition with up to 639 published articles in one day. The other premium players are mirror.co.uk, thesun.co.uk and theguardian.com with a daily indexed article rate between 224 and 575. The bottom player in the upper department is belfasttelegraph.co.uk. 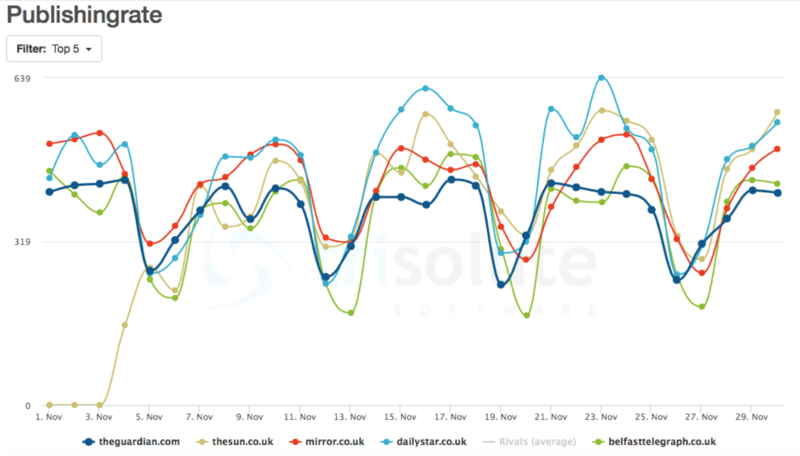 And do not wonder about thesun.co.uk – we only just started crawling their data from the 4th November onwards. Theguardian.com and bbc.co.uk in front by a long shot. Let us now take a look at the desktop News Boxes and some familiar faces. One of those, theguardian.com is the runner-up in desktop visibility. But almost invincible on top is bbc.co.uk with a visibility of up to 35.65 percent. 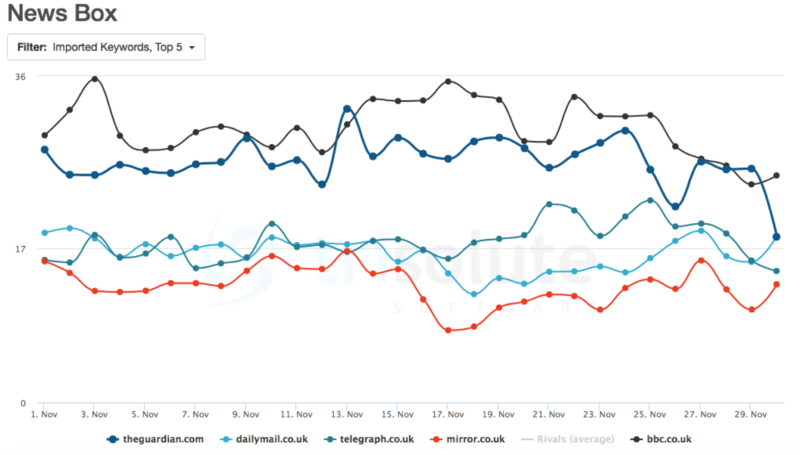 On third position we have telegraph.co.uk with a somewhat closer to top visibility rates in the second half of November. On fourth position one can find dailymail.co.uk – meeting theguardian.com on the last day of the month with a visibility of 18.26 percent. At last we have another known competitor: Mirror.co.uk reaching their highest visibility at the 13th of November. Fluctuating picture for the dailymail.co.uk. In the Google News Boxes (including non-AMP and AMP Carousels) for mobile, theguardian.com inches out bbc.co.uk by up to a 14.37 percent difference. In the middle ground we have mirror.co.uk and telegraph.co.uk. In a placement on its own we see dailymail.co.uk with a high fluctuation in their visibility – we have visibility scores as low as 14.58 percent and as high as 43.49 percent. Theguardian.com is the front runner in the News Carousels. Reviewing only the News Carousels, we see a somewhat similar picture. But distinguishing itself from the News Boxes results for mobile, theguardian.com gets to be the lone top competitor. 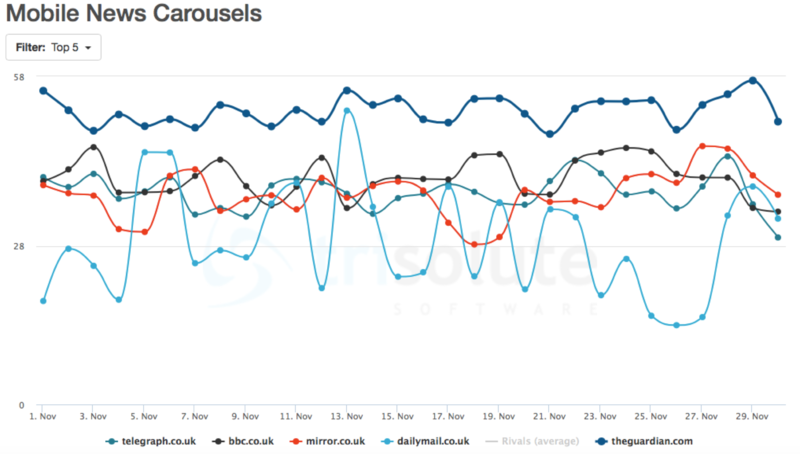 Bbc.co.uk shares its rank with mirror.co.uk and telegraph.co.uk. Dailymail.co.uk oscillates even more than before. Independent.co.uk making the top 5 for AMP Carousels. But our main interest lies in the AMP Carousels. These differentiate by a great proportion from the News Boxes for mobile and desktop and all Carousels. What is similar is theguardian.com on top. But the middle field is very close-knit with bbc.co.uk, mirror.co.uk, telegraph.co.uk and independent.co.uk replacing dailymail.co.uk on fifth position. For the publishers on positions two to five we have visibility scores ranging between 20.02 and 47.30 percent – not even close to theguardian.com worst score of 49.64 percent visibility. The competitors with the most indexed/published content are: the guardian.com, thesun.co.uk, mirror.co.uk, dailystar.co.uk, belfasttelegraph.co.uk. We find only two of them in the News Boxes for desktop and mobile – so that maybe the most content does not necessary means the prime Google News visibility. 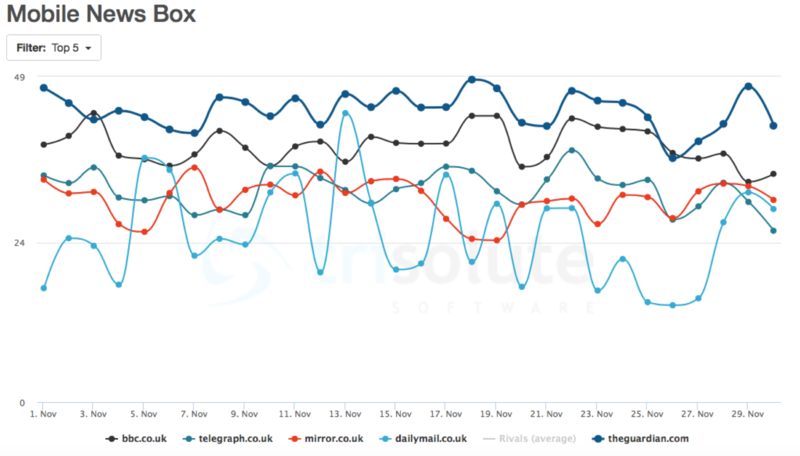 The top overall competitors in the Google News Boxes are theguardian.com, first in mobile visibility, and bbc.co.uk as the top runner in the Google News Boxes for desktop. On places three to five we have mirror.co.uk, dailymail.co.uk, and telegraph.co.uk for mobile and desktop visibility. For AMP Carousels specifically, independent.co.uk makes the top 5 and dailymail.co.uk drops out. Overall we have not a similar picture for desktop and mobile visibility, but always familiar players.